At Shepherd of the Hills, we teach the orthodox doctrine of the Christian church, especially as clarified by the Lutheran reformers of the 16th century. Our mission is to take what Jesus gave to his Apostles, and continue to pass it on to new generations. However, because culture changes, we are always seeking to communicate the Gospel in fresh ways which are understandable to modern people. We believe that if people can understand God’s Word, many will be saved by God’s Word! Click on the links below for more detail. Grace alone, faith alone, word alone. Grace: We teach that God is a merciful God, “who desires that all would be saved,” “who makes it rain on the just and the unjust,” “who while we were yet sinners died for us.” All life is a gift from God. We were enslaved by the Evil One, but we are rescued from the power of sin and saved from death by Christ’s death and resurrection. Faith: “You are saved by grace, through faith, apart from doing good works.” We teach that there is nothing we can do to earn God’s gifts. His blessings are not a reward. But, without a faithful trust in God ‘s love, His gifts remain “unopened.” So, by trusting God above all else, and turning first to God, we personally experience God ‘s love. Word: God’s Word is the only norm and authority in our church. There is no Bishop or other church leader who can judge scripture. Scripture judges us! Luther translated the Bible into the common language of the people, because with the Holy Spirit, God’s Word is available to everyone, without the need of a priest or an expert. The Holy Spirit is important. The Holy Spirit is needed, not because the Bible is hard to understand, but because it is hard to accept. Sinful man understands the Bible, and rejects God’s truth, and the Good News, until the Holy Spirit softens our hard hearts so that we come to faith. Emphasis on Good News. The heart of the Gospel is that Christ died for us, so that we are now reconciled to God, forgiven, and so can have a new relationship with God. So, we can celebrate and live joyfully, because we have been forgiven. We do not have to save ourselves, or fix the world. God is taking care of that. The energy we save having to justify ourselves to God can be freely spent in loving our neighbor. Evil is real, and powerful. We recognize that in giving us the precious gift of true freedom, God allows people to choose evil. The Bible teaches that evil is inspired by spiritual agents who have rebelled against God, who seek to turn us away from God’s love and wisdom, and enslave us to self-destructive behaviors. God’s good creation is broken. We need the power of Christ to free us from this slavery to sin, and heal the broken creation. God is more powerful. On Easter Sunday, Jesus defeated sin, death, and the devil. In Holy Baptism, God offers the power of His resurrection to all who believe. In Baptism, as we receive the life-renewing power of the Spirit, we also receive the power to reject evil and live joyful, transformed lives. We teach that the Holy Bible is the Word of God, and is the sole source and norm for Christian faith and life. We teach that ALL of the Bible is the Word of God (not just the parts we like). We teach that the Bible is ALL of the Word of God (God isn’t giving us new teaching which contradicts the Bible. We uphold the Lutheran teaching that the Bible is clear, and that the Bible interprets itself, and the Bible transforms those who hear it. We read individual bible verses in light of the whole bible, instead of taking verses out of context. We recognize that some parts of the Bible are poetic, and communicate God’s Word through story and image. We believe that the entire Bible witnesses to Christ. God speaks in the Bible through both Law & Gospel: God speaks to us in Scripture, through both commands/expectations, and mercy/comfort. Neglecting either looses the whole. The Law reveals God’s will for us. It is like a mirror, showing us how we have strayed from God. Only when we are aware of our need to be saved, does God’s offer of forgiveness and mercy make sense. And only when we have the confidence of God’s saving grace, are we able to be admit to our sin, without fear of judgment. The Bible leads us to the cross. There is no salvation without dying to sin. God doesn’t bless our selfishness or offer a secret for personal success; God invites us to offer our lives to him, and discover that true life comes through serving others in Christian love. We practice the priesthood of all believers. All members are in ministry. The pastor is not “the minister,” but the one who is set apart for the task of teaching God’s word and gathering us through the sacraments. 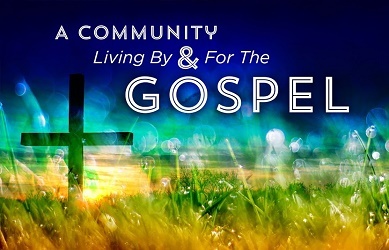 The pastor’s role is to “equip the members for the work of ministry, that they might be mature.” The ministry of the baptized is expressed by Christ-like service within the church, in our homes, in our neighborhoods and places of work. We are stewards of God’s gracious gifts. All that we have is a gift from God. We live joyfully, acknowledging these gifts of life, love, family, church, & Jesus Christ. God has entrusted us with particular gifts for service, which include our financial resources, as well as our talents and spiritual gifts. Our lives have great purpose when we responsibly steward these gifts, investing them in witnessing to God’s love and building His Kingdom. We all have a Christian vocation. In God’s eyes, there is no distinction between secular (the world) and sacred (the church). All is sacred. We do our work, whether being a barber or baker or banker, with honesty and excellence, seeking to serve others and make our corner of the world a more heavenly place. God meets us both through Word (preaching) and Sacraments (ritual & mystery). God meets in a many and various ways. We experience the joy of forgiveness through words we hear, through the washing of water (Holy Baptism), and through fellowship of bread and wine (Holy Communion).